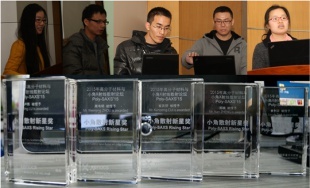 Poly-SAXS’15 was held in Changchun Institute of Applied Chemistry, Chinese Academy of Sciences from 19 to 22 Jan. 2015. The conference organized by the State Key Laboratory of Polymer Physics and Chemistry was chaired by Prof. Yongfeng Men. MM Could you tell me a bit more about the Poly-SAXS conference and its aim? YM The conference invited Chinese leading-scientists and PhD students in the field of polymer science using SAXS as a primary characterizing technique. This is the second one after Poly-SAXS’13. The aim of the conference is to provide a platform for scientists of similar interest in the field of application of SAXS in polymer systems to exchange new ideas in both technical advances in SAXS and understanding of properties of polymers. MM: What was the focus of the conference this year and what did you think of this year edition? YM: This year we focused on crystallization and deformation in polyolefins. The conference successfully gathered leading active scientists in the field in China. MM: What would you say such a conference brings to the polymer community? YM: This specific topical conference helps polymer scientists learn much faster and easier how SAXS can be applied to solve different problems in polymer structural characterization. With its dedicated PhD student presentation sessions, it displayed a unique scenario where young scientists as PhD students participate directly to the oral program in such a way that they get trained and networked among them. MM: At the end of the conference, a special award sponsored by the State Key Laboratory of Polymer Physics and Chemistry and Xenocs was given to five ‘rising stars’. Could you tell me a bit more about this award? 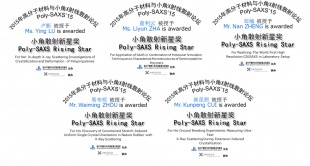 YM: This “Rising Star” award was given to PhD students who have made significant contribution in the field of technical development of SAXS and polymer science using SAXS. For example, Mr Nan Zheng was awarded for his achievement in developing world first grazing incidence ultra small angle X-ray scattering technique at the elongated Xeuss system (doi:10.1107/S1600576715001752). We are thankful to Xenocs to have been a partner of this event. Xenocs is one of the most advanced company for providing solutions for nanocharacterization of polymers using the SAXS/WAXS technique. MM: Do you already have some wishes and perspectives for the next edition of Polysaxs? YM: The conference will be certainly continued next year. We will focus on both developments in SAXS technique as well as main stream polymer science for next edition.